In recognition of President Woodrow Wilson’s involvement in the formation of Veterans Day, the Woodrow Wilson Presidential Library and Museum is co-sponsoring a free Veterans Day program with the First Presbyterian Church of Staunton. The ceremony to be held at the First Presbyterian Church at 11:00 on November 11th will begin with a moment of silence to remember all veterans; followed by Woodrow Wilson portrayer Judd Bankert presenting excerpts from President Wilson’s announcement of the armistice that ended World War I. In addition to the program, all veterans, active military members, and their families will receive free admission to the Presidential Library that day. On November 11, 1918, President Wilson announced the armistice, or temporary halt of fighting in World War I, which took effect on the 11th hour of the 11th day of the 11th month. 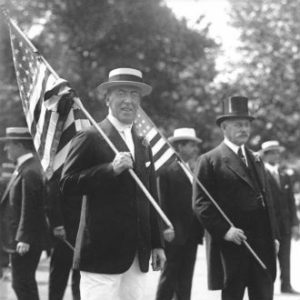 The following year, he proclaimed that November 11 would forever be Armistice Day in the United States. The day evolved into Veterans Day, when all veterans are remembered and honored and on which, for years, the entire country observed a moment of silence at 11:00 a.m. This year’s program will be on the 98th anniversary of that Armistice. Free admission to the Presidential Library for veterans and their families includes guided tours of President Wilson’s Birthplace and self-guided tours of the Woodrow Wilson Museum, which features the World War I trench exhibit and President Wilson’s 1919 Pierce-Arrow limousine. Those interested in more information about the Veterans Day program or the free admission offer should contact Bob Robinson at the Presidential Library, at (540) 885-0897, ext. 102, or by email atrrobinson@woodrowwilson.org.